On Thanksgiving day, four ethnically diverse families -- Vietnamese, Latino, Jewish, and African American — gather for the traditional meal. Each family has its own distinct way of cooking the traditional holiday meal and its own set of problems. Ruth and Herb Seelig (Lainie Kazan and Maury Chaykin) welcome their daughter Rachel (Kyra Sedgwick) home for the holiday. Rachel brings her lesbian lover Carla (Julianna Margulies), much to Mom and Dad's discomfiture. Additional relatives, not yet clued in, are scheduled to drop by. Trin and Duc Nguyen (Joan Chen and François Chau) have just had their son ejected from school. If that isn't enough, Trin has found a condom among her daughter's possessions. And her son isn't bothering to attend the gala affair at all, but is secretly going to the home of his Latino girlfriend at the Avilas. Mrs. Elizabeth Avila (Mercedes Ruehl) is separated from her husband Javier (Victor Rivers) since he had a tempestuous affair with her cousin. Unbeknownst to Elizabeth, son Tony (Douglas Spain) has invited Papa over for the holiday meal as he has nowhere else to go. Unbeknownst to Tony, Mom has her own bombshell to drop. And, of course, the Avila daughter, Sofia (Maria Carmen), has invited her non-Latino boyfriend. 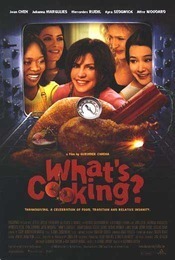 In the meantime, Audrey Williams (Alfre Woodard) must both cook and make nice with her overly critical mother-in-law, Grace (Ann Weldon), while the former's husband, Ronald (Dennis Haysbert), referees. The state of the couple's marriage is tense, and their teenage son, Michael (Eric George), isn't expected to appear for unstated reasons, which perhaps is just as well as Ronald's approval rating of his boy is at an all-time low.